Our Brazilian Jiu-jitsu program is focused on building a solid foundation of fundamental techniques. We believe that great jiu-jitsu is simple jiu-jitsu. This means that we teach high-percentage proven techniques that almost anyone can easily learn and apply in a real situation against a resisting opponent. The most fundamental techniques of Brazilian Jiu-jitsu are simple and direct, yet highly effective. Once a solid foundation of basic techniques has been built, the intermediate and more advanced student will learn to create a dizzying array of technique combinations. It is at this stage of training that the focus lies on helping each student develop the techniques and combinations that best suite their individual body types and abilities. Training at this level does not just focus on technique alone, but also strategy and tactics. Progress is measured on the mat through the real-life application of technique during our sparring sessions at the end of every class. We also have many open-mat training sessions which allow for extra training time. You may use the open mat sessions for drilling technique, conditioning, or sparring. The core of our program focuses on training in the traditional gi (uniform). It is this type of training which allows you to develop a technical and effective style of fighting. Training in the gi allows for a large variety of techniques from the standing position, as well as on the ground. These techniques include strikes, throws, take-downs, sweeps, pins, chokes and submission holds. 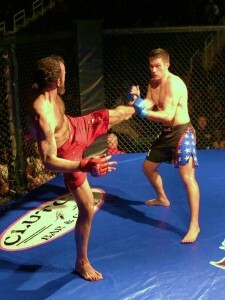 Sometimes the uniform is used against the opponent as well, for certain chokes and submission techniques. This is basically Brazilian Jiu-jitsu minus the traditional training uniform. Practitioners typically wear grappling shorts and shirt. This type of grappling does not allow a lot of opportunity for holding onto your opponents clothing, which often makes for a faster moving fight. The same type of techniques are used in Brazilian Jiu-jitsu as are used in Submission Grappling. Brazilian Jiu-jitsu includes a core set of self-defense techniques that address some of the most common types of street attacks. You will learn to defend the sucker punch, head lock, bear hug, and many other types of attacks. If you aren’t learning these techniques, you aren’t learning complete Brazilian Jiu-jitsu. 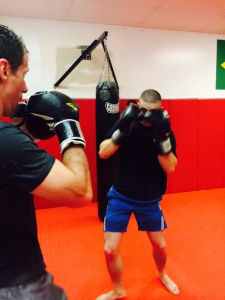 We supplement our Brazilian Jiu-jitsu training with additional training in boxing and kickboxing. We train these techniques like a fighter training for a bout- using only contact drills against training equipment such as the focus mitts and heavy bag. Brazilian Jiu-jitsu incorporates a lot of unique conditioning exercises meant to compliment its fighting techniques. Our conditioning program incorporates these unique routines as well as modern strength and conditioning exercises. Kickboxing has been around for centuries. Almost every culture has employed some form of hand to hand combat as a defense against enemy nations, for personal protection, or to enhance physical fitness and well being. Our training philosophy is to keep things basic, training only those techniques that have been tested and proven to work. Students learn to use your body’s natural weapons, primarily the legs, knees, elbows and hands. This is a workout that challenges you both physically and mentally. However, you don’t have to be a fighter to practice. This level will get you in shape. Students work basic and fundamental kickboxing technique and develop cardiovascular endurance. This class prepares you for progression to level 2. This level will push you to a higher level of conditioning and fitness. Students work advanced and strategic techniques, defense awareness, sparring tactics, fighting combinations, and self-defense. Students are also introduced to sparring. Please e-mail to reserve your spot today. The practice of Brazilian Jiu-jitsu improves focus, coordination, physical fitness, self-esteem, and builds character. This is all accomplished in a fun and exciting training environment. Top Game teaches our students the world’s most effective form of self-defense. Students become empowered to handle problems, including bullying. They acquire crucial tools needed to effectively defuse a threatening situation before it escalates. Most importantly, our students can easily defend themselves against physical aggression. Success on the mat leads to success in school, social settings, and in life. Every parent wants the best for their child. Top Game Jiu-jitsu provides them with the opportunity to cultivate all of the attributes needed to be successful and happy. Why should I choose Brazilian Jiu-jitsu for my child, instead of other martial arts? Brazilian Jiu-jitsu has been proven to be the most effective form of unarmed combat and self-defense, when compared to all other martial arts. The techniques allow for realistic practice, against a fully resisting opponent, without the fear of sustaining injuries. The essence of Brazilian Jiu-jitsu is to take the stronger, more athletic and physically aggressive opponent out of his element and into the clinch and ground phase of an altercation, where his advantages can be nullified. Most martial arts never even address this part of an altercation… Brazilian Jiu-jitsu specializes in it! Children naturally like to be rough and tumble… When you put them together for play, they’ll more often than not start wrestling. It’s a natural thing for kids to want to grab, push, pull, tackle and grapple, so most kids easily take to training in Brazilian Jiu-jitsu. With Brazilian Jiu-jitsu, there are no fancy jump or spinning kicks, no useless forms to remember, just effective techniques that have been proven to work time and again in real situations. 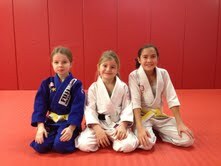 Why should I choose the kids’ program at the Top Game BJJ Academy? Our instructors are not only active practitioners of Brazilian Jiu-jitsu, but they are also fathers, and all of their children train as well. We keep our classes small, so that all kids receive a lot of individual attention and hands on instruction. We usually have at least three adult instructors to every five children. Our program requires that kids maintain good grades at school, good behavior at home, and at the academy. *** Don’t be fooled by traditional martial arts academies claiming to teach grappling. We specialize in authentic Gracie/Brazilian Jiu-jitsu. Our Black Belt instructors are ranked and certified under Gustavo Machado, an IBJJF certified 3rd Degree Black Belt. Please e-mail (chris@topgamebjj.com), call (804)-426-6619, or stop by the academy at 8324 Staples Mill Road, Richmond, VA 23228 at 5:30 pm on Monday, Wednesday, or Thursday to enroll your child.